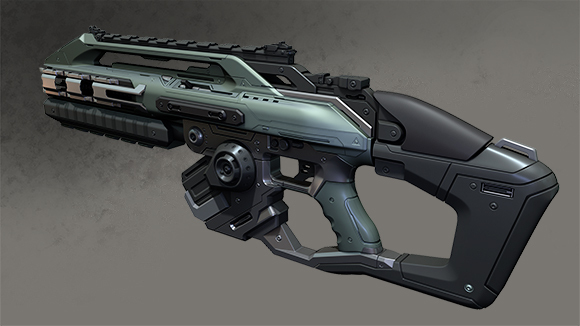 Ammunition Type: Railgun ammo, power cell. Power cells are integrated into the magazine. Very high muzzle velocity allows projectiles to be launched at fantastic speeds, making them nigh impossible to dodge, and providing a significant kinetic impact. Modular design allows for barrel to be changed between Carbine, Assault and Sniper variation, and sniper sights or under-barrel attachments such as a grenade launcher can be added. Fire selector allows for single shot, five-round burst (recommended), or full-auto. Very resistant to wear and external damage. High round velocity and durability with frangible core supports penetration and internal damage. Regular maintenance is essential to prevent critical failure. A powerful enough EMP will reboot the weapon's onboard system, disabling it for several seconds. The need for custom made ammunition makes finding reloads on a battlefield practically impossible. The weapon's semi unique design makes it incompatible with other forms of ammunition. The weapon itself, and especially the custom ammuniton, have very high manufacturing costs. Only a few reloads for each weapon are generally produced as part of each very limited production run. Significant recoil makes accurate fully automatic fire very difficult. MandalArms has been working on extensive upgrades for the MandalArms firearms line which was now split off into two series: the Gauss series and Railgun series. There are several differences between the two: Gauss guns fire a round that floats within the barrel when being launched therefore suffering no barrel degradation as seen in most firearms or overheating, is cheaper to make, and is completely silent. A rail gun however launches a round at much more powerful speeds than Gauss while being very susceptible to barrel degradation, overheating, being louder, and increased recoil. MandalArms however has addressed these issues to contain the negative effects by decreasing the base rate of fire and magazine sizes in the rail guns series. This does not mean though that the issues are completely gone and that they are not susceptible to its problems. Routine maintenance is still required just like any other firearm. To cut down on recoil, MandalArms has made the inner components of their firearms with a number of metals in addition to its recoil dampening stocks: Condensed-matter composite which was originally designed to distribute forces evenly across a vehicle to prevent any harmful structure vibrations caused by powerful engines and trace amounts of neutronium which was known for its ultra-dispersive characteristics. Despite these upgrades, the Railguns still had a sizeable recoil. This is compensated in the rifle-class weapons with inertial compensators unsuitable for pistol-sized weaponry. Due to extremely high velocity of the slugs being fired, there is a high possibility that the rounds from even a pistol can completely penetrate through an unarmored or lightly armored opponent, causing little to no kinetic damage to the target. To counteract this, regular rounds for were made to act like frangible rounds in which the rounds would shatter after striking the target. Often the round would penetrate and then shatter, enabling penetration yet allowing the kinetic force of the round to dissipate into the target, causing massive kinetic and internal damage. Even the frangible rounds proved highly capable against medium to heavy armor, causing kinetic trauma even if the round did not pierce due to the massive firepower behind the round (a single assault rifle round has the kinetic yield comparable to that of a .50 caliber round). However, a secondary round was developed to act like a jacketed hollowpoint round in which the round expands at impact yet has massive penetration power. The end result is enabling the rounds to pierce even some heavy armor, and cause significant damage to light and medium vehicles and yet cause large cavity wounds in the target. Such rounds however easily overpenetrated lightly armored opponents. Dallorian alloy which was naturally resistant to heat, was used in the primary components for preventing the firearms from overheating. In addition, the firearm used a small cooling system. However, excessive use still caused the firearms to overheat on occasion if constantly being used in the automatic setting. If the firearm overheated due to the user ignoring the heating display, the firearm would shut down after five more seconds of ignoring the warnings and remain off until the weapon cooled down which could take several seconds. To reduce barrel degradation and damage to rounds, the firearms made use of the alloys ferrocarbon, which was incredibly strong and corrosion resistant, hadrium, which was often seen in the barrels of blasters due to its high melting point and lack of malleability, and Denscris, which also had a high melting point, as well as Silicar. Edited by Kaine Australis, 14 February 2018 - 03:17 AM. Loudness To reduce the loudness of the firearm, the barrels have been fitted with an advanced sound suppressor. This needs to be reflected in the strengths. Overpenetration and Regular Rounds Due to extremely high velocity of the slugs being fired, there is a high possibility that the rounds from even a pistol can completely penetrate through an unarmored or lightly armored opponent, causing little to no kinetic damage to the target. To counteract this, regular rounds for were made to act like frangible rounds in which the rounds would shatter after striking the target. Often the round would penetrate and then shatter, enabling penetration yet allowing the kinetic force of the round to dissipate into the target, causing massive kinetic and internal damage. Even the frangible rounds proved highly capable against medium to heavy armor, causing kinetic trauma even if the round did not pierce due to the massive firepower behind the round (a single assault rifle round has the kinetic yield comparable to that of a .50 caliber round). However, a secondary round was developed to act like a jacketed hollowpoint round in which the round expands at impact yet has massive penetration power. The end result is enabling the rounds to pierce even heavy, mechanized armor, and cause significant damage to light and medium vehicles and yet cause large cavity wounds in the target. Such rounds however easily overpenetrated lightly armored opponents. The end result is enabling the rounds to pierce even heavy, mechanized armor, and cause significant damage to light and medium vehicles and yet cause large cavity wounds in the target. An automatic hand-held weapon capable of piercing heavy mechanized armor is a bit too much. Capable of delivering damage to light vehicles is fine. This would need to be dropped significantly. Say 70 since it's semi-unique. It's not too dissimilar to the pistol version here power-wise. I get that tradeoffs need to be made for ammo capacity and rate of fire though. I have edited to remove the suppression and the part about heavy mechanized armor. I have also added the penetration to Strengths. Would it be acceptable if I edited to make it unique? I certainly don't plan on distributing these wide. Edited by Kaine Australis, 14 February 2018 - 02:53 AM. Every submission is judged on its own merit. We do not take other approved submissions as precedents. That said - it is fine if you want to sub it as Unique, meaning that only one character can use it and I would assume that would be you. But my request for ammo drop remains - 70 auto fired .50 cal (in power) as a handheld weapon capable of damaging light mechanized is as the maximum I would give.